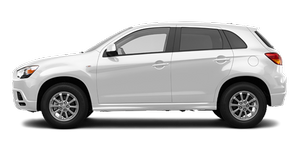 The Mitsubishi Outlander Sport earned top scores of Good in the Insurance Institute for Highway Safety's front- and side-impact crash tests. It hasn't been tested for rear impact or roof strength at this time, so it's not yet eligible for Top Safety Pick status. Neither the 2011 or 2012 model has been crash-tested by the National Highway Traffic Safety Administration at this time. You can find a list of standard safety features here.